Thanks to the movie Next I realize that time travel is impossible. 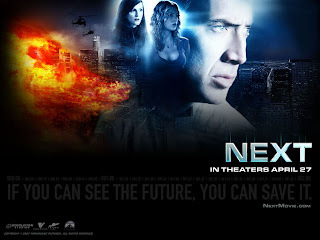 In Next, Nicholas Cage plays a man named Cris Johnson who can see into his own future a few minutes, while he can see a long ways into the future of his soon-to-be girlfriend, Liz Cooper (Jessica Biel). Also, Julianne Moore plays a hard-nose FBI agent (I think her name is Julianne Moore). But God would never allow anyone to have the give of seeing into the future. This would violate the sacred gift He gave all people, called “Choice.” For the same reason God would never allow time travel. The power to choose is like a superpower that God gave every human being. Thanks to this superpower, all people have the ability to alter their own lives and the world around them. People can wield this power for the cause of either Good or Bad. Every person in the world is exercising Choice a million times every second, continuing forward with each step, word and gesture. Therefore, it would be impossible for anyone, even Nicholas Cage, to see even one second into the future. The future is changing in an infinite variety of ways all the time. If Nicholas Cage could see the future, this would nullify the fact that people must make choices every second and then live with their choices. People would be unable to make the choices they meant to make because Cage would be interrupting them. For the same reason that no one can see into the future, time travel must be impossible. The future does not exist yet therefore there is nothing to travel to in the future or see.